I have some good news, and some troubling news. I’ll give you the good news first. 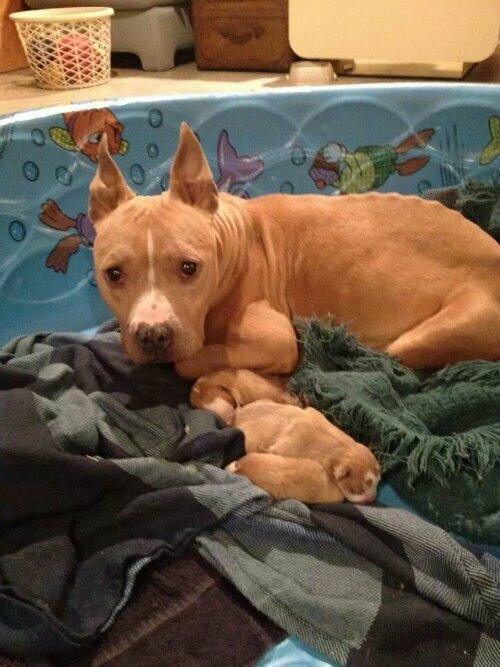 A mama pit bull and her three pups were rescued from Chicago Animal Care and Control a few nights ago. Here is where it starts to get troubling. There had been four pups but they lost one the first night, sadly. My friends at A & S Rescue could use some help. 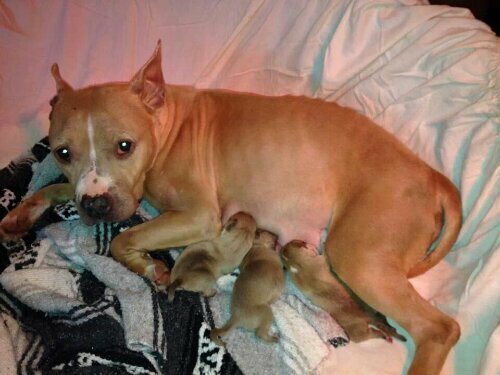 Mama Sophie and her babies are terribly malnourished and dehydrated. While I wrote this post, another pup was lost. Now just two remain. If at all possible, please donate what you can to A & S. They do such good work, and will be caring for this canine family for quite some time. Vet bills are piling up for these new rescues, and there are still other fosters to care for. You can visit A & S Rescue on Facebook. You can donate at aandsrescue.com/helping. Thank goodness, we have a suspect in the Puppy Doe case! I know you were all as relieved as I was that there was a break in the case. As I had suggested in previous posts, they just weren’t telling us everything. It’s a good thing too. The guy had already fled the state. Who knows were he was planning to go when he checked out of the La Quinta. By the way, I don’t blame him at all for staying there. I love La Quinta. Excellent choice. As you all know by now. The man accused of torturing our Puppy is Radoslow Czerkawski, 32, of Poland. I will not honor him with a photo or further mention of his name. He is here illegally, and has no permanent residence in the States. I am sure this contributed to the $500,000 bond that was issued. Blah blah blah…you know all of that. What you might not know is that the 11 counts he was charged with are stack-able. I have this information from a representative of the MSPCA, Raina Connelly. She seemed to be just as excited as I was about my question as to whether the counts are stack-able. She did not know they were stack-able, until she researched it for me. What this means is that each count he is charged with that falls under Animal Cruelty carries a maximum sentence of 5 years in prison and a possible $2500 fine. I am unclear on all that he has been charged with. I have read 11 counts of Animal Cruelty. I have also read 11 total counts, including Animal Cruelty and Obstruction of Justice. Let’s say that it’s 11 counts of Animal Cruelty, plus additional charges, for now. With the charges being stack-able, he could get a maximum of 55 years in prison and $27,500 in fines just for in Animal Cruelty convictions. There would be additional time and fines for the other charges. I know we all hope for stricter laws for Animal Cruelty cases everywhere, but let us just be thankful that MA changed this from a misdemeanor to a felony a few years ago. Now, have you all noticed that the news is reporting that he was a care taker for an elderly woman in Quincy? Yes, apparently he was a care taker, without having the certification to be a care taker. This troubles me greatly. This sort of under the table job is exactly what a budding serial killer might need to set himself up to prey on the weak. Worse, the woman for which he was caring died the very same day that Puppy Doe was found, August 31. All reports I have read so far say she died of “natural causes” and that the dead is “not suspicious.” I hope that there is a side investigation going that they are not telling us about yet. The woman died on the very day that the suspect needed to flee. That in itself is suspicious to me. I hope there was an thorough autopsy. Thanks to Examiner.com, for the link to this petition to get the maximum sentence for the Puppy Doe Case. ” For trial attorney William D. Kickham, the search is about more than punishing whoever is responsible for the dog’s pain. Please read the full Boston Globe article here. Judging by my stats, people are looking for ways to help with the Puppy Doe case when they come across my blog. You can also help by looking for or starting fundraisers for The Animal Rescue League of Boston. They have closed their own fundraiser for their $5000 reward, but you can always just make a donation. They have lots of animals to help. There is a petition to encourage Craigslist to stop allowing “free to a good home” transaction. I am thinking about ways to get rid of breed specific legislation (BSL), and to change how animals are given up for adoption. If you have great ideas, pass them on to your representatives. This is why I care about Puppy Doe. While it was the sad photo of adorable Kiya, with her injuries and infected leg, that caught my eye, it has been the statements of Dr. Martha-Smith Blackmore that have kept me coming back to this case. This is the doctor who completed the necropsy, confirmed the age, and level of abuse Kiya suffered. There were many critics out there saying they didn’t even try to save Kiya. I was certain from the original reports I read that they did the right thing. Having now read the necropsy report, I am relieved for Kiya. They did the right thing in putting her out of her misery as soon as possible. The Examiner has described the necropsy here. If you would like all the graphic details, follow the link The Examiner provided. Be warned. It is a horrific report. All of this leads up to why I care. Of course I care about Kiya. She was beautiful, and reported to be sweet. Pitties are my favorite dogs. No living creature deserves the treatment Kiya got. That it was an animal so near and dear to my heart, saddens me further. My real concern is the extent of her injuries, and how she was discarded. The person who tortured Kiya was able to do horrifying things to her and still keep her alive. Kiya’s nostrils were burned. Her eyes were stabbed. Her tongue was split. Her bones were broken. Her joints were drawn. They were not just dislocated. They were drawn, a medieval torture method. These injuries prevented Kiya from walking again. She laid in her own urine, accumulating pressure sores. Her head was misshapen from the blows she received. Fragments of bone trapped in her soft tissue formed protective calluses around them. All of these injuries were not sustained at once. They were all found to be in various stages of healing. So, Kiya, for an as yet undetermined number of months received a steady stream of torture. Forgive me for asking, but why not just kill her? Someone who does these sort of things, clearly gets some sort of pleasure from it. Dr. Martha-Smith Blackmore states Kiya is unlikely the torturer’s first victim. Why not just kill her when you’re done with her and dispose of her? Why leave her alive and completely ruined, in a public place. She was left on the side of a road near a park. It was a certainty that she would be found. Here are my thoughts on that, based on nothing but my Hollywood-level education in criminal profiling. It is a cry for help. Disgusted by what he (most likely) has done, he left Kiya in the open. His survival instinct tells him to hide. His guilt tells him to confess. So he leaves the biggest clue he can as a compromise. It is arrogance. He has been at it for a while and no one has noticed. He has been practicing on animals and not getting caught. He wants everyone to know how masterful he is. Knowing he won’t be a suspect, he wants to see his handiwork on the news. It is a Coming Out. He has now perfected his method. He can do horrible things over an extended period of time, without killing his victim. He is done with animals. Discarding Kiya publicly was his Graduation Day. I am well aware that all of my scenarios sound like serial killer behavior. Honestly, I can see no other path. This isn’t run of the mill animal abuse. He didn’t just slap her around, or lock her in a closet, or kick her down the stairs. He didn’t even fight her or use her to bait fighting dogs. He straight up tortured her. I don’t know of anyone who does that other than serial killers in training. But he didn’t kill Kiya, and that is what troubles me most. If the torturer is caught now he will get a maximum of: 5 years in prison, a $2500 fine, and never being allowed to come in contact with animals again. If he is done with animals, and moving on to humans, as is the usual progression, what next? Crappy sentence aside, I hope he is caught before he can hurt anything or anyone else. I just want to make that clear, because this next part is a doozy. If he does the same thing to humans as he did to Kiya, we will view him as a serial killer but he will not be killing. Some morning a girl is found on the side of a road. She is emaciated and brutalized, but alive. She will of course be rushed to the hospital where heroic measures will be used to save her life because we don’t euthanize people. Surgeries will be required to repair the severe damage done to her. They will be done because it’s the right thing to do, and because letting 2 or more people die so we can label him a serial killer is unthinkable. That is what he would be forcing the good doctors and nurses to do: save him from officially being a serial killer. What would the punishment be if he were caught after torturing a person? What would the charges even be? It is the stuff of gruesome fiction, yet it seems it could be happening right now in Boston. I actually have something to say. This is in regard to Puppy Doe. Now, I’ve been following Justice for Puppy Doe on Facebook. I find many of the comments to be disgustingly judgmental. They also seem a bit uninformed, to me, so I wrote this. ” I think a lot have people have missed some of the facts so I am posting what I have found here, and on the news. Kiya was found alive. Her injuries were so severe that it was unlikely she would ever recover. She was unable to walk. Within hours of her discovery she was euthanized, after receiving a belly full of food and lots of love. 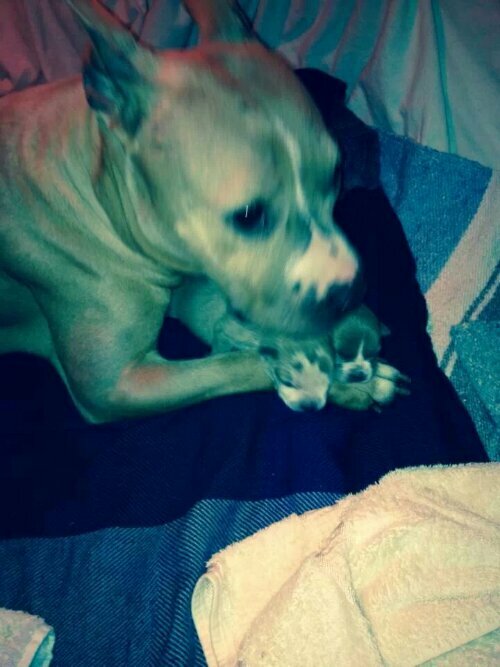 Kiya is known as Puppy Doe, but the original owner has stepped forward with pictures, and Kiya’s name. Kiya’s markings are distinctive enough to easily identify Kiya as the Puppy Doe we know from that horrible picture. Kiya’s original owner could not keep the dog because of her landlord’s rules. She responsibly gave Kiya up to people she knew and trusted. Those people are the ones that put Kiya on Craig’s List. Most CL pet sales go smoothly. Until now, the worst case scenario was whether the dog would end up as bait for fighting dogs. Even if the people vetted the new owner for dog fighting, there is no way they could have seen this coming. In hindsight, we can all be angry we didn’t see it coming, but we shouldn’t be angry at the people who gave Kiya up. If we have to blame anyone who is not physically responsible for injuring Kiya, it should be the landlord with the breed/size limit. That rule is what started this. In my opinion, saying someone should be homeless and destitute over finding what they thought was a good home, and not blame the rule that forced her to choose is ludicrous. I am deeply disturbed but the witch hunt that is going on. Horrible, nasty things are being said about the original owner. As someone who has had to give up pets, I know what a hard decision it is to make. In my case I simply could not afford to move with my dog. Being homeless does not help the dog. It only helps your guilt. I don’t see that as a reasonable option. I’ll probably have more to say but it will have to wait. I have to calm down.